>Block Island before the crowds. >Brenda headed home on Wednesday night and my younger son Chris and his friend Dan joined me in Mystic to spend a few days on Pandora. 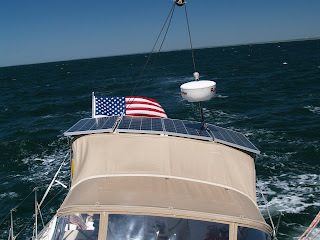 On Thursday morning we headed out to Block Island off the coast of Rhode Island. 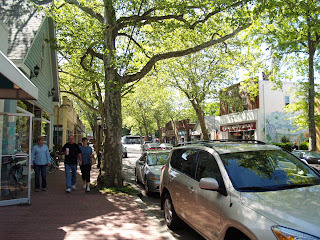 Block is a great spot and while it feels like a world away, it’s just 15 miles from Watch Hill Passage at the most eastern end of Long Island Sound. I have mentioned my solar panels in past postings and here’s a shot of them in action. I am getting up to 20amps mid day and nearly 10amps even in the early AM hours. This is terrific as it is allowing me to be much more liberal with my electrical consumption. I could probably leave the cooler on when I am away from the boat for a week but I am not willing to try that out quite yet. We had a really great trip over on a beam reach in about 18kts of wind. Pandora raced along in moderate seas at 7.5 to 8+kts. With the tide pushing us along a bit faster, we made it in about 1.5hrs from Watch Hill Passage. By the time we got to Block it was blowing about 20 from the southwest but was still a really nice day. The guys and I rented bikes and rode all over the island and came back in time for dinner I have to say that I did OK for a guy of my relative maturity against a few 22+ year olds. Having said that I felt a bit of pain in the rear when I eased myself onto the bike seat again today. 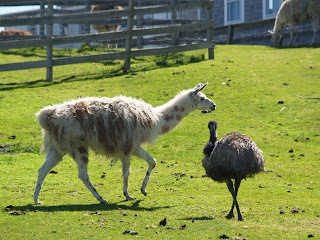 Now, here’s something that you don’t see every day, a Llama and an Emu. And, to top it off, a sign that says “don’t feed the camels”. I guess that means that it’s OK to feed the Emu but what do they eat? 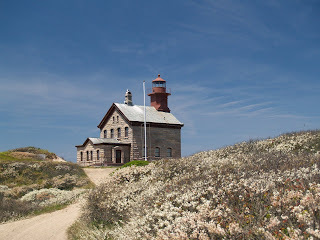 Today we biked out to the North Light which marks the most northern part of the island, while the rest of the island is fairly built up, this area is still quite wild and protected as a bird nesting place. 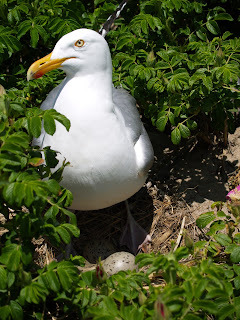 And given the fact that we visited so early in the season gave us a first hand look at nesting gulls. I have never seen a baby gull and just assumed that they popped out fully grown or at least grew up from rats that turned into gulls when they got big, a sort of metamorphosis like a butterfly, if not quite so pleasant as the caterpillar to butterfly thing. It was quite amazing as there were gull nests everywhere including some places that were right on the path to the lighthouse which suggests that there hasn’t been much in the way of foot traffic lately. season as my visits usually are in July and August when things are really hopping. I was just stunned when we entered the New Harbor to see that there were less than 5 boats. It was just amazing to see a harbor where you usually have to standby with your dink to race toward a mooring when a boat leaves. With moorings first come, first served, that’s the only way to get one in the busy season. For those of you who have been there, this shot will surely strike you as abnormal and very vacant. While I normally anchor I decided to get a mooring close to shore given the Strong winds when we arrived yesterday. While it’s not yet busy it wasn’t too early for the harbor master to come and get his fee first thing on Friday morning. Our original plan was to head back on Sunday afternoon but with the weather forecast calling for rain and thunderstorms all day Saturday we decided to just head back to Mystic on Friday and catch a train on Saturday morning, rain or not. As much as I like the boat I am not inclined to spend a day on board in the rain if I can avoid it. As I write this we are headed over toward Watch Hill Passage under power as the forecast of 10-15kts from the southwest has not materialized. The Sound is a glassy calm with just a hint of a breeze. 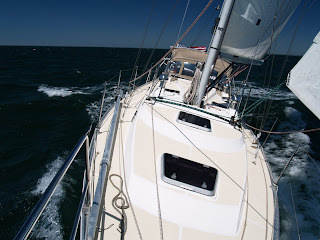 The wind ultimately picked up and we had a great sail back to Mystic. It’s now Saturday and it is indeed raining but we are headed back to Norwalk and our car via train. Well, no time on Pandora for two weeks. 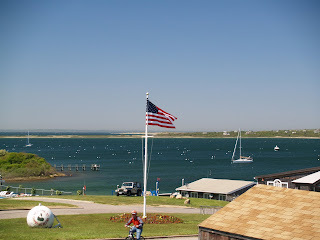 Our next trip will be over to Shelter Island for a Corinthians rendezvous and on to New Bedford MA. >Cutting the cord, if only for a week. 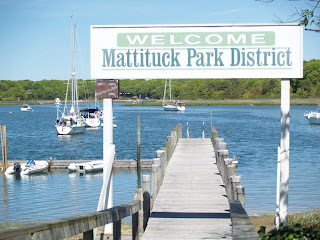 It’s 6:30 am on Sunday and we are anchored in Mattituck which is a small harbor on the North Shore of Long Island about half way between Port Jefferson and Greenport. I didn’t know exactly what to expect when we got here last night around dusk as I had not been here in many years. Brenda and I were talking about it but couldn’t decide if I had been here just twice or three times. The harbor is over 40 miles from Norwalk, where we left from yesterday at 1:30 which was the limit of our range given the fact that we had left so late on Saturday. Try as I might, I just couldn’t get done before noon with finalizing the solar panels. This was the big project over the winter and is designed to be the first step in getting Pandora ready for more serious cruising. 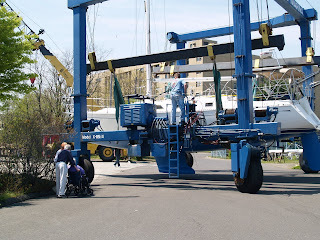 I had to wait until after the rigger had finished working on the boat as they had to access the backstay which was all tangled up with the bimini which hold the panels. The installation is made up of four Kyocera 130 panels http://www.kyocerasolar.com/products/ksimodule.html should put out about 50-60kwh per day in this lattitude and over 100kwh in places that we could say are “a lot sunnier”. They are located on top of the bimini and look quite serious if I can say so myself. Anyway, back to Mattituck. The harbor is about two miles down a narrow curving chanel (the depth alarm went off time and again as the depth came in under six feet) that leads to a small dredged pond with room for about 6-8 boats. While anchoring was a bit tough since the bottom was gooey and I wasn’t putting out enough scope, we finally got anchored and settled in for dinner. I recall the first time that Brenda and I visited this harbor. It was over 25 years ago and we were on our first boat TAO, a 20′ Cape Cod Catboat. We came all the way here from Bridgeport where we kept the boat. That’s nearly as far as we came yesterday and that was on a boat that had a cruising speed of 4-5 knots under the best of conditions with a tiny 5hp one cylindar diesel. That’s in dramatic contrast to Pandora’s 7-8 knot speed under power or sail. On that trip so many years ago we were with our now long time friends Chris and Pat Blossom. Let me tell you, it was really cramped on TAO and we didn’t even have standing headroom. I know that we came out with the plan of visiting friends and did but can’t recall what the details of that were. Well, we came and went but it couldn’t have been as carefree as it was yesterday with Pandora. The wind yesterday coming over from Norwalk was a reasonable 15kts with a few gusts to about 20kts from the northwest which allowed us to keep our speed up in the 7kt range for about half of the distance. However, in order to make the harbor by dusk we ended up motorsailing for the second half. Today we hope to get ashore and look around a bit and will head around to Sag Harbor for the night. I have a friend John Kenlon from work who’s family has place there and we hope to meet up with him. We will see how the day goes. 12:00: We had a nice trip to shore and walked downtown to the village. It was very quaint and we purchased some cheese at a very “Hamptonesque” shop in town. While not nearly as flashy as the Hamptons, Mattatuck is certainly well monied with lots of really nice cars coming and going. Here’s a nice shot of Main street. When we came here the first time on TAO we saw what was surely the oddest museum that one could expect to see on the North Fork of Long Island, a tank museum. Not water tank, the Sherman kind. Unfortunately, now all that’s there is a garden center. So much for progress. Well, it’s time for lunch and after that we will leave to head over to Sag Harbor. >Back in the water, finally! >Well, I have been remiss in not posting since Pandora came out of the water in November. It’s been a very busy winter and it seems that I was up working on the boat most every weekend. I can’t even begin to list all that has been done to the boat but I have gotten a new genoa, main, storm trysail and storm jib. I also had a new propshaft put on and installed Spurs to keep lobster pot warps from fouling the prop. And, many subtle upgrades to make Pandora more comfortable and ready to go offshore. This photo is of Pandora being launched a few weeks ago. The two folks to the left are my mom & dad who came down to watch the boat go in. I kept Pandora in Bridgeport CT, near where they now live, so that I was able to see them a lot over the Winter. It was a thrill to see them both come down. It’s tough for them to get around these days which made their presence all the better. Wow, they both look so small next to the lift. Our plans for the Summer include moving around quite a bit. On Memorial Day weekend we will leave Norwalk Yacht Club where she is now and head out to Shelter Island in Eastern Long Island Sound. We will hang around for a few days and then I will drop Brenda in Mystic so that she can head home for a three day weaving workshop in New York. Christopher, my newly graduated (Yea!) 22 year old will join me for a run to Block Island on that Thursday. My oldest, Rob and his fiance Lauren will take the Block Island Ferry out to meet up with us. Keith Reynolds, a fellow SAGA 43 owner who winters in the Bahamas has offered for us to use his mooring in Mystic until he arrives in mid June. We will also be using a friend’s mooring for a few weeks in New Bedford MA so that it will be easy to do a few weekends over to Martha’s Vineyard. Brenda and I are also planning to visit Wickford RI and enjoy our friends there for a few weekends of sailing in Narraganset Bay. That takes us up to late July when I will take Pandora back to CT and the Stonington Harbor Yacht Club to participate in the Stonington to Boothbay Harbor race that the Corinthians are sponsoring. Check out the site at http://www.stoningtontoboothbayharbor.com/ and see the list of boats that are entered. The race is rated as a category #2 which means that we are going to be substantially on our own but within east Coast Guard and helicopter range if we get into trouble. We will have all sorts of safety equipment on board including a liferaft, EPIRB (emergency satellite transponder) and a crew of seven. The course for the race will take us East to Nantucket light which is about 60 miles SE of Nantucket and left up to Maine. It’s a long way with a 350nm course length. Following our arrival in Maine we will participate in a cruise with the Corinthians for a second week. After that we will come home for Rob’s wedding which takes place on August 23rd in CT. Very exciting! Well, that’s not all as we will head back up to Maine for yet another two weeks on Pandora. At the end of the trip I will bring Pandora back to CT in mid September. Lots of sailing this Summer.